Meg Says: The Perfect Pair of Blue Jeans? I've Found 'Em! The Perfect Pair of Blue Jeans? I've Found 'Em! As a long-limbed human being I always found it difficult to find jeans that hit me at the right places and fit as dreamily as I wanted them to - they either hugged my waist wonderfully but swung inches above my ankles, or they were the right length but I needed to create extra notches in my belt. Eventually I discovered a pair which I stuck with, despite them having a tendency to lose their hold and colour after a few washes, until now. Now, you see, I've found a new pair that tick every box: high-rise, waist-hugging, super skinny, holding power, ideal length. They're from Hollister and are their High-Rise Super Skinny Jeans, and as I nearly always opt for black I decided to switch things up in the denim department and go for a gorgeous rich deep blue that has a subtle fade to make them look nice and 'lived in'. I pretty much haven't taken them off since I got them as they fit like a glove - I ordered a 3 and went for the 'long' leg length - and if I could design a perfect pair of blue jeans in my head, they'd be these! 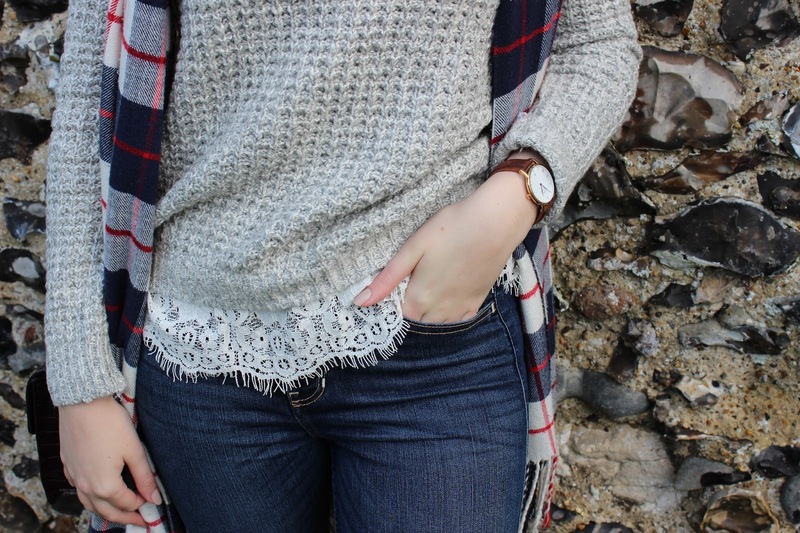 I've been pairing them with this Grey Lace Hem Sweater that's unbelievably soft, has really pretty detailing around the bottom and is only £17.50 at the moment! I also picked up the same jumper in the Cream version as it's such a 'me' knit. As this is something I'd wear for a cosy family day of walking the dog and stopping at a pub for Sunday lunch, I've gone for comfy ankle boots - these tan Western ones are a couple of years old from Warehouse but I've found some similar and affordable ones from New Look here and here. My bag is last year's Kurt Geiger Frances Wine Cross Body Bag, and they have a new version this year called the Serena Wine Cross Body Bag that's just as lovely! I've finished the look with my Daniel Wellington Dapper Durham Watch, a checked scarf and a dainty sideways gold feather necklace, as well as a swipe of the Tanya Burr Cosmetics Lipstick in 'Big Kiss' for a warm red autumnal lip. All of the websites I've featured are running Cyber Weekend deals of up to 50% off, so make sure you check out the links above to ensure you get those discounts!